This book uses Python 3.x syntax. You can download and install python here.. Please make sure you choose to install python version 3.x. The first command, python --version, will provide the default python version installed, which is typically version 2.x. The second command, python3 --version, will provide the version of python3 if it is installed. If you see something like the following, you will be good to go. If you are familiar with some simple terminal commands (knowing how to traverse directories), I would recommend using a text editor instead. Sublime Text and Atom are two robust, popular text editors. If you are on Windows, Notepad++ is also good. 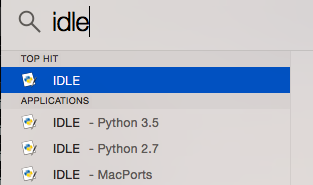 If you are looking for a fully-featured python IDE, I recommend Pycharm, but only if you know what you are doing. If you are new to python and programming, just stick with one of the text editors above. If you choose to write your code online, I highly suggest using c9.io. Not only is it a fully-fledged linux virtual machine, but the interface is great. This entire book, along with all of the lab solutions, were written on a c9 workspace. An account is free, but a credit card is required at signup. VISA/Amex gift cards should work to get around it, but if you don’t feel safe with it, or if you need a way around it, please don’t hesitate to contact me.